Note: You may also find this book published with the name Clarges. In Clarges, a city in the far future, humans have conquered death. Unfortunately, there’s just not enough room for billions of immortal people to live forever, so they’ve passed the fair-play act which divides society into 5 phyle which must be maintained at certain population ratios. Those who choose to participate in fair-play must register in Brood, the lowest phyle, and receive 82 years of life, after which an “assassin” visits and takes them away in a black hearse. By significantly contributing to society, citizens may move up through the phyle, adding several years of life with each step. A very select few will reach Amaranth and may have their bodies genetically modified (with 5 copies made, in case of accidents), making them youthful forever. This social climbing causes a lot of anxiety for the people of Clarges, so their mental hospital is full of people who’ve gone “catto” (alternating periods of catatonia and mania). Gavin Waylock has been in hiding for seven years, but now he’s ready to return to the immortal society that shunned him. He’s back at the bottom and must use all of his wits to work his way up to the place he knows he deserves. Things would be a lot easier, though, if he hadn’t just met The Jacynth Martin, because she’s determined to keep him out of Amaranth. One thing I love about Jack Vance is that he writes about things that fascinate me. As Gavin is trying to figure out how he can contribute something creative and meaningful to society, and thereby push himself ahead of everyone else, he tackles the field of psychology. I found it great fun to read Vance’s ideas about the future of my field. To Live Forever was written in 1956, at a time when “insane asylums” in the United States were full. Vance must have thought this to be a hopeless situation because while his characters are zipping around in aircars and have plenty of other cool future technologies, one of their psychotherapists tells Gavin that their hospital is full, and psychology is the only science that isn’t progressing, because it’s impossible to see inside the human brain. Though Mr. Vance’s vision didn’t seem to foresee much beyond Freud and Jung, at the same time one of his characters comes up with an idea to treat catatonic-mania that is stunningly brilliant and something very much like what is only now being tested as a treatment for post-traumatic stress disorder! Wow! You don’t have to be a psychologist to love To Live Forever. This is a fun, fast-paced, and clever science fiction novel, but it isn’t at all “gadgetty,” so it will probably appeal even to those who think they don’t like scifi. It’s also, as is common for Jack Vance, part humorously scathing social commentary. Update: September 1, 2015. 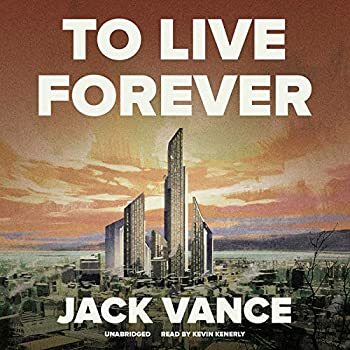 Today Blackstone Audio released an audio version of To Live Forever, so I was thrilled to re-read this book again in this new format. Kevin Kenerly does a great job with the narration. I loved it. To Live Forever — (1956) Publisher: Gavin Waylock had waited seven years for the scandal surrounding his former immortal self to be forgotten. He had kept his identity concealed so that he could once again join the ranks of those who lived forever. He had been exceedingly careful about hiding his past. Then he met The Jacynth. She was a beautiful 19 year old, and Gavin wanted her. But he recognised that a wisdom far beyond her years marked her as one who knew too much about him to live. As far as she was concerned, death was a mere inconvenience. But once The Jacynth came back, Gavin Waylock’s life would be an everlasting hell! That’s one of my favorite Vance novels. I used to reread it every few years, first in Dutch and later in English, but it’s been a while again… may have to dig it up soon. A terrific book. I love nearly everything Vance does (I guess that’s obvious). His stories are always entertaining and I love his cynical sense of humor, but on top of that they usually make me think about stuff I like to think about. In this case, what would happen to a society who conquered death? As much as we’d love to do that, there’d be some serious consequences. How would we decide who gets to live on and who must die? Your review, which catches my eye every time I come to the Vance page, makes this novel sound like one of his most interesting. I finally realized Vance changed the title to Clarges when he released it digitally. Perhaps we need a list of Vance’s titles and what he changed them to for digital release since he seems to be changing the titles of quite a few of his works. I’m not sure, but it might be that he is calling them what he originally wanted to call them (the publishers ultimately make these decisions) or it could be what they were called in another country. 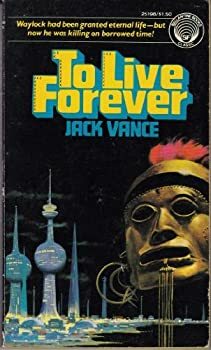 Jack Vance’s son told me that he is working with “Dutch enthusiasts” to re-format the books for release as e-books on JackVance.com, so it may be that they know the books with those other titles. If you’ll let me know which ones have alternate titles, I can add them to the reviews. as well as Clarges. The titles of quite a few shorter works were restored as well, notably The Insufferable Red-headed Daughter of Commander Tynnott, OTE (Assault on a City). For any further information about the VIE (which occupied most of my free time between 1999 and 2006) feel free to write. BTW: I quite agree that Lyonesse is Vance’s masterpiece. There is only one edition that is completely faithful and that is the very reasonably priced ebook at jackvance.com (the Gollancz omnibus comes close but is somewhat sabotaged by shoddy production values). UPDATE: Today Blackstone Audio released an audio copy of TO LIVE FOREVER. I read it and it’s wonderful!